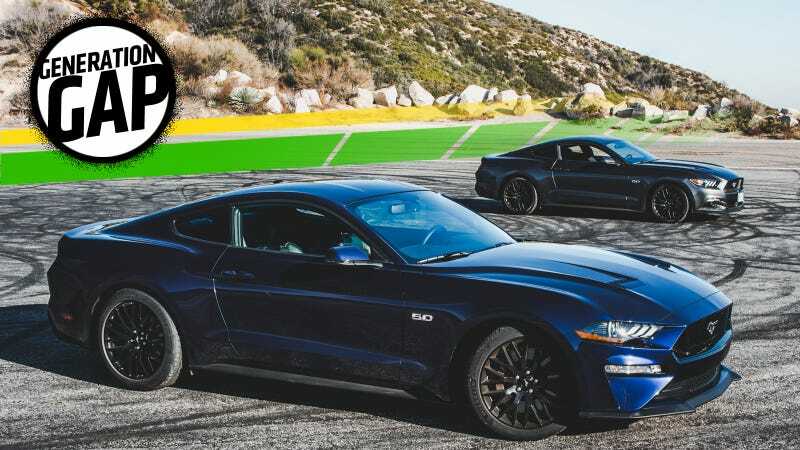 But since we’re civilized, we just pulled the 2018 Ford Mustang GT over next to my friend’s 2016 Ford Mustang GT to find out exactly how different the two cars look and feel from one another. This pair is really remarkably similar: both stock GT manuals with the Performance Pack, and the ’16 only has about 13,000 miles on it making this a pretty straight-across comparison. The biggest difference between the two is the MagneRide option and interior upgrade that comes with the Premium trim in the ’18. The 2015 Ford Mustang blew minds and rocked faces with all-new underpinnings and a revolutionary design that carried through the 2017 model year. Remember how everyone freaked out over the fact that the Mustang was finally going to be fitted with independent rear suspension? So most of the 2015, ’16 and ’17 Mustang GT reviews you’ve read probably praised the car’s improved handling over the last solid-axle model. The 2018 took the same basic setup that was introduced in ’15, gave it a little more power and a few aesthetic tweaks. The question is, how much better is it really and what can you actually feel? The 2016 GT ran an aluminum 302-cubic inch (4.951-liter) V8 that Ford claimed could make 435 horsepower and 400 lb-ft of torque on 87-octane gasoline. The 2018 GT uses the same engine “retuned,” according to Ford’s ad copy, to make 460 HP and 420 lb-ft of torque. The spec sheet says a bore size increase from 92.2 millimeters to 93.0 millimeters, new direct fuel injectors, a new cylinder head design, additional knock sensors, a new crankshaft and connecting rod bearings plus a composite oil pan all contribute to the power boost. As for the transmission, the 2018 GT’s six-speed manual got a new dual-mass flywheel which is supposed to reduce noise, vibration and harshness, a new twin-disc clutch that is rated for more torque capacity than the old one, plus changes to the tooth geometry and synchronizers which are designed to improve shifter feel. The 2016 Mustang GT measured 188.3 inches front-to-back and weighed a claimed 3,705 pounds. The 2018 car is just a hair longer at 188.5 inches overall, and apparently weighs the exact same as the outgoing car. Both Performance Packages unlock a range of tweaks, the most significant of which being big Brembo brakes and a Torsen limited-slip rear differential with a 3.73 gear ratio. The 2018 cockpit has all the same shapes, but the cluster is different. The starkest contrast between our 2018 Mustang GT and the 2016 was, predictably, in the seats and interior. The 2018 we had was a GT Premium which increased the fanciness of the cockpit markedly with leather seats, a high-quality central infotainment screen as well as, most impressively of all, a wide fully digital gauge cluster rendered in razor-sharp resolution and absolutely dripping with color. The ergonomics and general shapes of the interior are unchanged. Remember, this is an update not a total redesign. And to be honest, as much as I loved looking at the new car’s crisply lit dashboard, the old model’s standard cloth seats did a much better job of holding me and bolstering me against hard turns. The traditional analog gauge cluster is tidy too. I mean, as long as you can get over “GROUND SPEED” written in the speedometer. The 2018 car has an undeniable edge in comparative straight-line pulls, though. The 2016 car is fast, but the new one’s extra 25 HP and 20 lb-ft of torque makes itself known early on. The new car hits you with a stronger bite around 2,500-3,000 RPM that pulls you just enough to make it seem significantly faster. I liked the feel of the new car’s shifter a bit better as well. Changing gears seems slightly more definitive in the new machine, and it had a more satisfying engagement. Our 2018 GT Premium was running the technologically impressive MagneRide suspension, which minimizes body roll and maximizes stability by constantly changing the stiffness of the car’s shocks. Basically, the shocks are filled with little metal flakes that can be magnetized to make the ride feel firmer or softer very quickly. It works, too. The 2018 hunkered down into turns like a linebacker as its 5.0 engine churned and burned and pulled the car to warp speed. It was also reasonably compliant over rougher roads, and felt a lot more aggressive in the “Sport” and “Track” modes. However, where the old car surprised me the most was that its handling wasn’t worse than the new one. The old car, with the Performance Pack, had a more traditional but still solid suspension setup featuring twin-tube front dampers and stabilizer bars. Edmunds.com actually wrote up a great tour of the ’15 Mustang’s Performance Pack suspension if you really want a close look, but my biggest takeaway from driving it hard through Angeles National Forest is that it’s damn responsive and well-planted. And, oh yeah, fun as hell. With that in mind, I found the MagneRide’s real practical advantage was the fact that it could absorb bumps a little more softly while stiffening up again for spirited driving. But for pure fun-factor, the standard Performance Pack suspension is still plenty impressive. The 2018 Ford Mustang GT and its immediate predecessor are both great cars, especially when dialed up a little with Performance Packs. While the ’18 has a little edge on acceleration thanks to a few extra horsepower, the most appreciable change the new car comes with is its adjustable digital dashboard. The new screen-based gauge cluster is so crisp and interesting without looking cheesy or distracting that it’s almost cool enough to make it worth saving up for an ’18 instead of grabbing a ’15-’17. The styling of the new car is also significantly sleeker, though you really have to have both cars parked next to each other to tell the difference. That said, I’m not sure I totally prefer the new look to the outgoing car but I’m sure you’ll share your own conclusions there in the comments. I will say though, definitively, that I favor cloth seats over leather even as I’m telling you the ’18 is a better car because of its nicer interior. It’s easier to stay planted against high-friction fabric. If interior technology and modernism are important to you, it’s absolutely going to be worth saving up for a 2018. (That or at least waiting until they get old enough to drop in price.) But if you’re just after a great driving experience, the earlier sixth-generation GT won’t let you down. In fact, if you’ve never driven a Mustang with independent rear suspension, I think even longtime haters of this model would be impressed by how tough it can hang on twisty roads.